Gaining theoretical knowledge and applying this knowledge into practice is the core of Dual Studies. Dual Study Programs aims to integrate theory and practical hands-on training. Studying in Dual Study Track takes place in alternating phases at two locations: The German-Jordanian University and the industrial partner’s facilities. Academic theory and workplace experience are combined to make students prepared to join the market place directly after graduation. This approach allows students to gain professional experience, soft skills and social skills required in everyday working life during their studies. 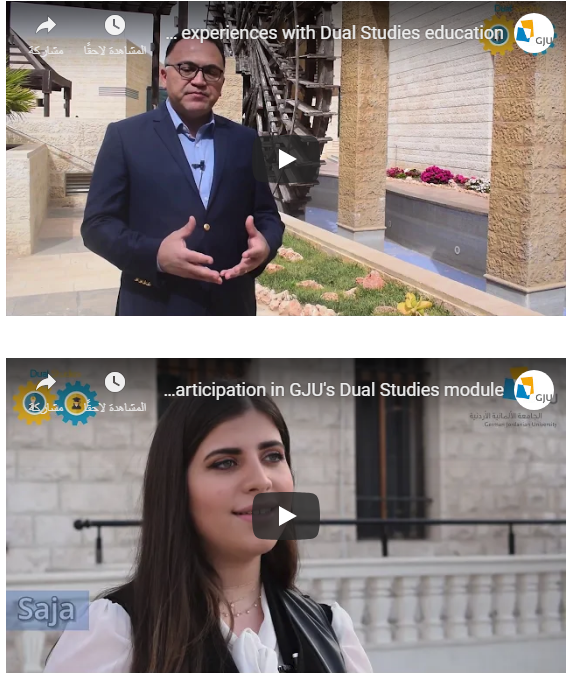 Based on the ultimate successful dual studies experience at Germany, Here in Jordan we have launched our own journey by forming Dual Study track fits our needs and challenges. Through this track we build a proper base full of opportunities and benefits for students, academics, and practitioners. Dual Studies means that the student will gain his/her academic knowledge at the GJU in parallel with applying it practically at predetermined local or international company; they will perform tasks, undertake projects and assignments according to their growing abilities and develop their skills with the supervision of more experienced co-workers. The ultimate aim is to achieve the maximum benefits for the students. The Department of Logistic Sciences at SMLS has took the initiative to apply this innovative approach on the national level, believing in the value added to all participants through this track. This entrepreneurial track starts with the academic year 2018-2019, in the department of Logistic Sciences. Due to limited available spaces in our partner companies, only limited number of student can join this track. Student will take place in alternating phases at two places; the GJU and one of our partner companies. Students will take their courses in the first and second semesters regularly at GJU and then spend the summer time at the partner company facilities. Regarding the study plan for this track, students will follow the predetermined and approved course plan by the Department of Logistics Sciences. Noting that, the confirmed courses plan for Dual Studies Track has the same courses as the regular track, but with different time frame which tend to be more structured and restricted. By linking the academic part with a real work environment, students will have an enhanced learning experience, and better understanding of theoretical concepts. In addition to the practical experience, students will acquire communication, interpersonal, and social skills. Furthermore, students will be integrated into organizational structure, work methods, and projects planning and implementation process, at the same company, during different phases of their study time. After graduating, students will have a valuable work experience reflecting their academic specialization. In other words, dual studies experience will add much value to the students’ bachelor degree. Dual study track students’ will have an excellent career prospects after graduating. They will have the opportunity to get a related job at the same partner company. According to a contract between the partner company and the student, the company will offer the student a monthly allowance to cover some basic expenses during practical phases. How many credit hours students will get during practical semester? ​Each practical semester in the dual study track will include two “Dual Study Courses” with 6 credit hours. The practical semester lasts for 12 weeks. During this time period, two Dual Study Courses will be delivered in an intensive way with 3-full days of training by GJU professors for each course. Students will receive some self-reading materials for each course and they will be evaluated by exams applied projects and other tools. These Dual Study Courses will be delivered in one or our industrial partners’ facilities. In addition a Zero credit hour course, with pass or fail result, will be assigned for each practical semester. Therefore students must pass the practical semester through an evaluation by the company in order to stay in the dual study track. The three practical semesters in Jordan will concentrate on three levels, operational, managerial, and strategic level. How can I register for Dual Study track? ​As mentioned earlier, by now this track is available only for the Logistic Sciences students. All student will be enrolled in the regular track in first semester at GJU. During the second semester, students can apply to transfer from the regular track to the dual track. The application process for students enrolled in the first semester 2018/2019 will tack place from March 5, 2019 until March 14, 2019.
Who Are our industrial partners? How Dual Study Pilot Model was tested at summer 2018? ​GJU’s Logistics students have successfully managed to “survive” the crash courses given by lectures Dr. Ismail Abushaikha and Dr. Muhammad Alshboul, and now even more than before indulge into the practical work in different units of the Aqaba Logistics Village (ALV). 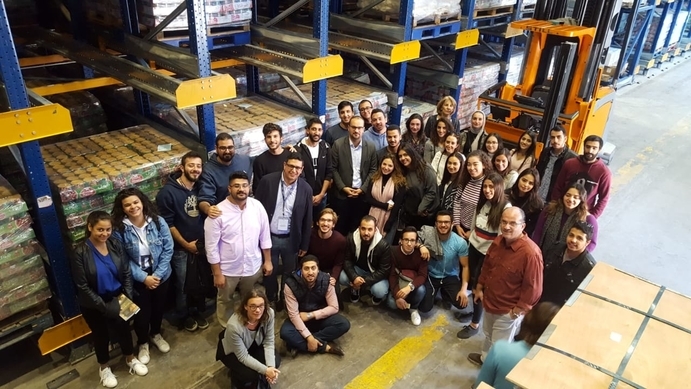 As the first crash course on “Warehouse Management”, also the seconds course with the topic “Export & Import Management” was attended by ALV staff (in addition to the three GJU students), namely an Operations Manager and one Logistician, who both attended full-time. Again, the general manager joined for some hours and gave input from his ample experience. Fresh feedback from the ALV administration and Mr. Hakam Abul Feilat, the General Manager, indicates once more that the students add valuable ideas to the daily routines and procedures in the work. Concerning the time structure of the module, lecturers and students already voiced some demand for a bit more time between the two crash courses and said it might be helpful if students prepare the content of the lectures individually beforehand. Besides this, after half-time it can be said that the pilot does not only match GJU’s and ALV’s expectations, but exceeds them. Students are in continuous contact with their supervisors by phone and email and will hand in experience reports, in order to further enhance the module. ​Further information will be available on this page in due time. Mrs. Haneen Yassin M. A.